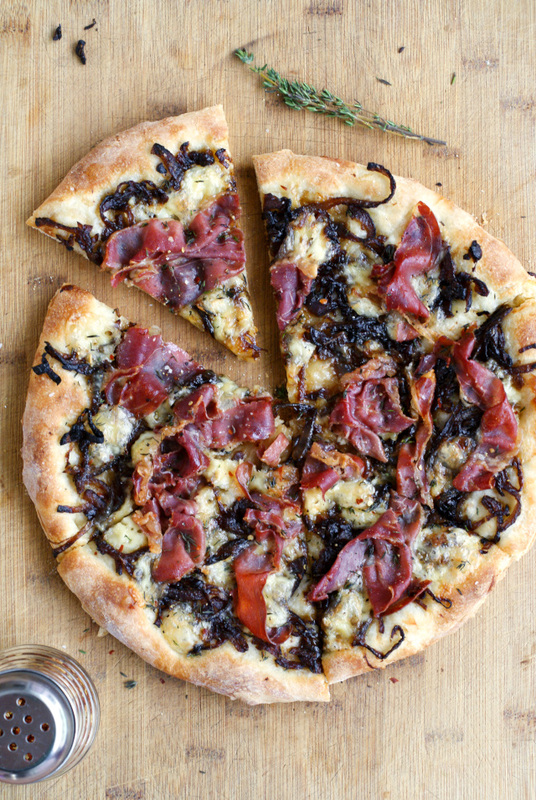 Brie, Prosciutto and Caramelized Onion Pizza has the perfect balance of ingredients: salty prosciutto, sweet caramelized onions, and melty brie cheese all cooked to perfection on the beautiful Soapstone Pizza Pan from UncommonGoods. Pizza is a favorite in our house and I'm always on the lookout for new topping combination so pizza night doesn't get boring. I could keep things boring city and eat just plain old cheese pizza forever and I'd be okay with that. Pizza is just so darn good. Buuuuut, it is fun to mix things up once in a while just for the sake of variety! Seriously, isn't is just gorgeous? It is a beauty and I knew right away that I was going to make an extra special pizza on it. Uncommon Goods is actually an extra special kind of company, so it just made sense to go all out. You might be wondering what makes this company I keep mentioning so special, so I'll explain. There's some seriously good mojo going on with these guys that you should know about! UncommonGoods (founded in 1999 in Brooklyn, New York) is a privately-owned retailer that endeavors to feature unique designs and handcrafted gifts created in harmony with the environment and without harm to animals or people. How absolutely fabulous is that? That seriously just speaks to my soul. Lowest-paid seasonal worker starts at 50% above minimum wage. Their mission is to support artists and designers by featuring more than 50% made by hand items. About one-third of their entire collection incorporates recycled and/or upcycled materials. Their products are simply gorgeous and unique! Why would you not want to patronize a company that is so upstanding and arts-centered? I urge you to take a look around their website and I guarantee you can find some fabulous goodies for you and some for your loved ones! The holidays are coming up rather quickly, arent they? I'm going to be honest with you here. I've never cooked pizza on a pizza stone before. I always use my old discount store pans. But, not anymore. 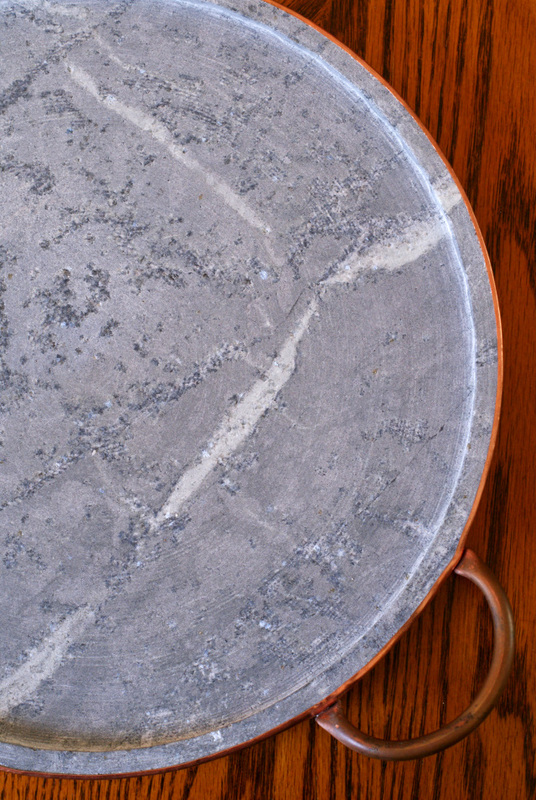 This lovely soapstone pan made the most amazing pizza ever. The crust was evenly cooked, perfectly crisp on the bottom, and soft and chewy in the inside. I'm a pizza stone convert, friends. But not just any pizza stone, this pizza stone. Not only does it make delicious pizza, but it has so much character, what with the lovely copper trim and handles. I'm so glad to have this piece in my kitchen arsenal thanks to UnCommonGoods! 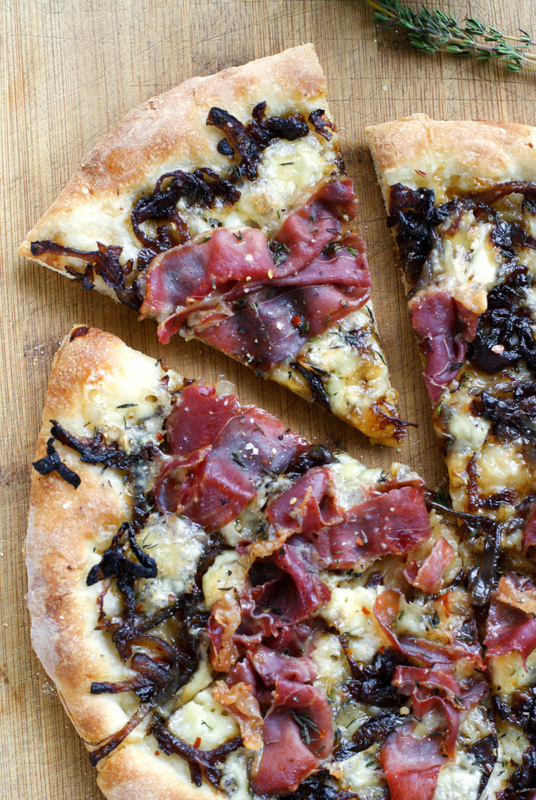 We haven't even mention how delish this particular pizza is. 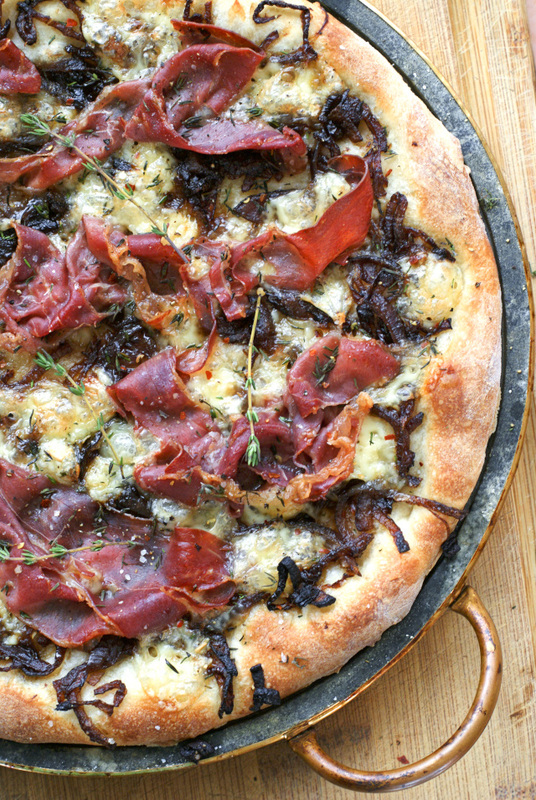 The brie is perfectly melty, the caramelized onion are golden and sweet, and the prosciutto baked up with little crisp bits. Add a sprinkle of aromatic fresh thyme and spicy crushed red pepper flakes and it's like a pizza wonderland. 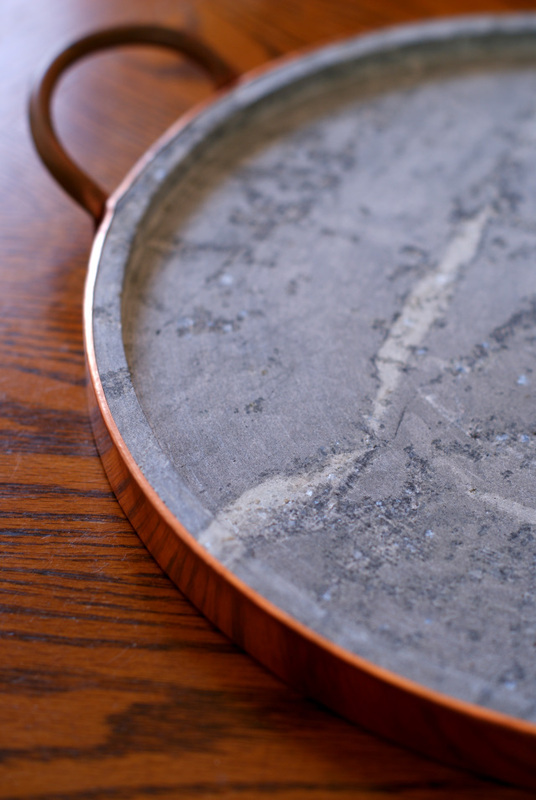 Try it, love it, and be sure to check out my new fave pizza pan from UncommonGoods. Love and pizza, y'all! Preheat your oven to 450 degrees with your pizza pan in the oven. In a skillet, heat butter and olive oil over medium-low heat until the butter is melted. Add the onions to the pan and cook for 20 minutes, stirring frequently. Remove pizza pan from the oven and sprinkle with cornmeal, if desired. Carefully place your rolled out dough onto the hot pan. Spread the caramelized onions evenly over the dough, topped with the brie cubes. 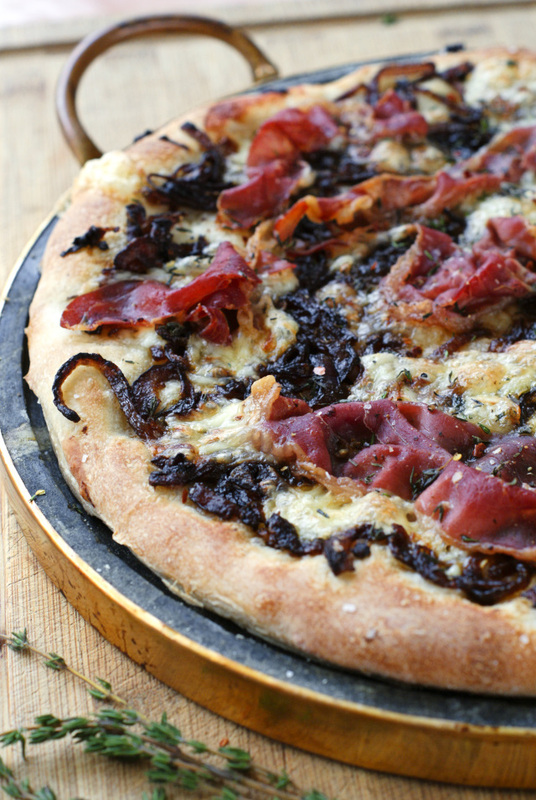 Lay the prosciutto over the top of the pizza and season with salt and pepper. Bake in the preheated oven for 12 minutes, or until the crust is golden brown. Let sit for several minutes before slicing and serving. Just to be safe, I slid my pizza onto a cutting board before slicing. I didn't want to risk damaging my gorgeous pan! I was sent a product from UncommonGoods in exchange for my honest review. All thoughts and opinions are, as always, 100% my own.